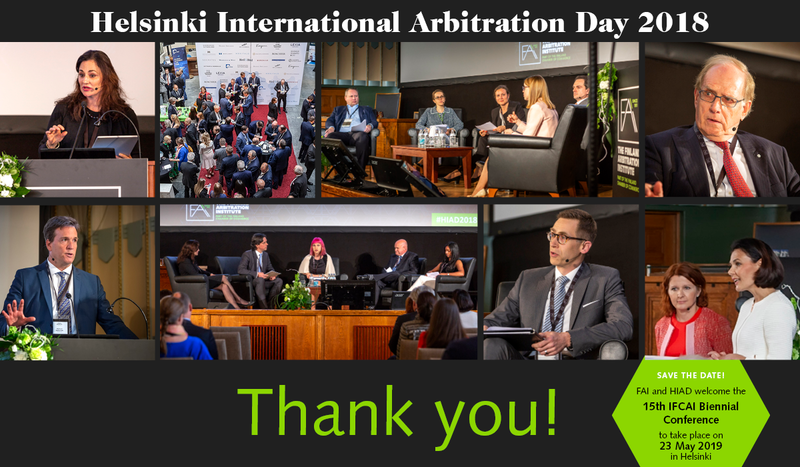 Helsinki International Arbitration Day (HIAD 2018) was held on 24 May 2018, in the Finnish capital on the topic ‘Shaping the Future of International Arbitration’. The seminar, now in its seventh edition, gathered leading international arbitration experts from Finland and around the world to discuss about the future of international arbitration and how dispute resolution can be tailored to continue to meet the users’ expectations of speed, efficiency and use of technology. Report of the HIAD 2018 available here. Published first in Kluwer Arbitration. Save the Date: HIAD and the FAI welcome the 15th IFCAI (International Federation of Commercial Arbitration Institutions) Biennial Conference to take place on 23 May 2019 in Helsinki.